Gold Grooved Design wedding band. 14k Yellow, White, or Rose gold comfort fit wedding band measures 5mm wide. This style is available in a large variety of sizes from 4 1/2 to 12. Special order in Platinum. Example weight: 5mm size 5 equals 5.85 grams. Gold Ridged wedding band. 14k Yellow, White, or Rose gold comfort fit wedding band measures 5mm wide. This style is also available in a 6, 7, or 8mm width. Example weight: 5mm size 5 equals 6.08grams. Grooved 5mm wide wedding band. This band is comfort fit and a delightful design. Price shown is for the size 7 weighing 6.3grams. Available in a large variety of whole and half sizes. Order in 14k White, Yellow, or Rose gold. 14k Gold Rope Edge Comfort-fit wedding band. Our price shown is for the size 7 weighing about 6.22 grams. Classic band with a rope edge feature measures 5mm wide and is available in whole and half sizes from 7 to 12. Order this great ring in 14k White, Yellow, or Rose gold. Check out our video to see this rings true beauty. 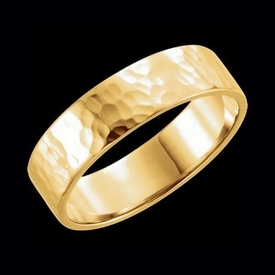 14k Gold Patterned Comfort-fit wedding band. Our price shown is for the size 5 weighing about 7.50 grams. modern design wedding band measures 6mm wide and price shown is for the size 7 weighing 7grams. Check out our video to see this rings true beauty. Sophisticated Grooved Comfort Fit wedding band. 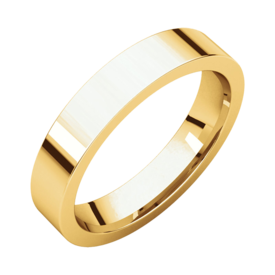 Wedding band measures 6mm wide and is available in 14k White, Yellow, Rose gold or Platinum selection. Our price shown is for the size 5. This band is 1.85mm thick. Check out the video so you can see the true beauty of this comfortable, wonderful wedding band. Email for Platinum pricing. Dramatic 14k Gold flat wedding band featuring a hammered finish. Wedding band measures 6mm wide and is available in 14k yellow gold, 14k white gold, and 14k rose gold selections. Beautiful hammered texture gives this ring a stylish edge. Triple rope design wedding band. 14k white, yellow, rose gold or Platinum wedding band measures about 5.25mm wide. This comfort fit wedding band is available in a variety of sizes, price shown is for size 5. 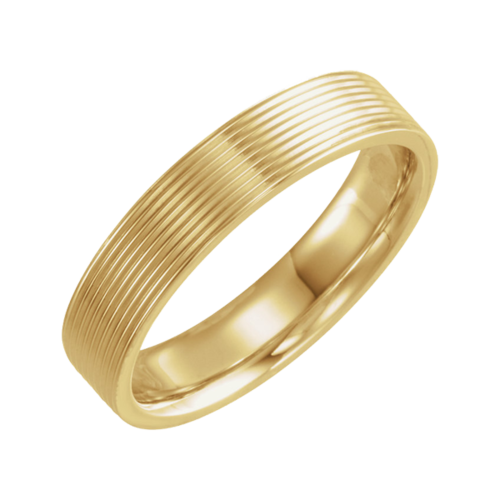 Beautiful 14k gold grooved design wedding band. Wedding band measures 8mm wide and is available in a variety of sizes. The grooved pattern in this ring goes all around created this design. Just one in our large selection of fancy design wedding bands you're sure to love. Wedding band is available in a large selection of sizes. Stylish 14k gold designer wedding band. This beautiful ring is available in 14k white or yellow gold and measures 7mm in width. You'll love this designer ring, it's available in a large selection of sizes. 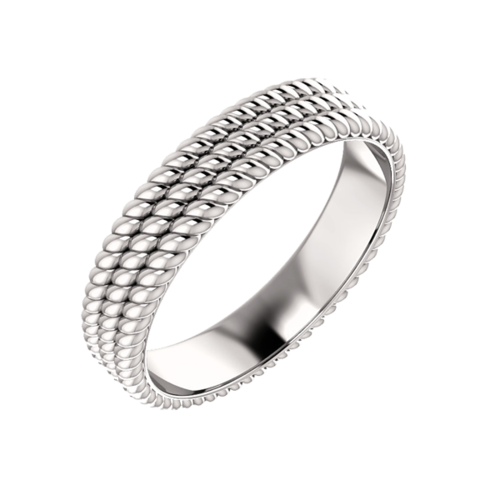 Greek key border design 14k white gold wedding band. A polished center strip is bordered either side with a greek key border for an attractive look. 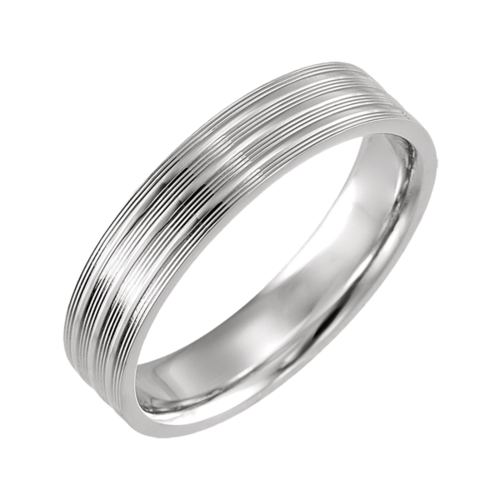 This wedding band measures 6mm wide and is an easy to wear comfort fit design. This band is available in your choice 14k White or Yellow gold, 18K gold, and Platinum. A wonderful symbol of your love and commitment. Custom made to order. Price shown is for the ladies size 5, 14k White gold. Comfort Fit flat wedding band. 14k Gold Classic design comfort fit flat edge style wedding band. 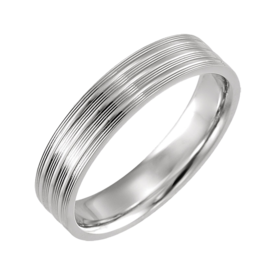 This popular wedding band is available in a large variety of widths starting with 2mm up to a bold 12mm width. 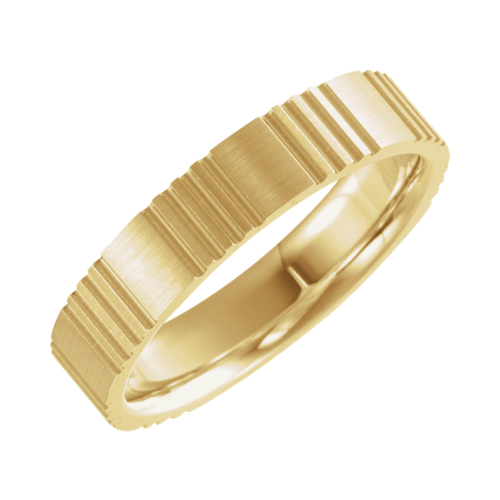 Gold wedding band measures 1.85mm thick and may be ordered in 14k yellow, gold, 14k white gold, 18k yellow gold, and Platinum. (email for 18k gold and Platinum pricing) FREE ENGRAVING, if you would like engraving choose a font from our font selections and add your sentiment to the comment box during checkout. Available in Polished, Satin, Florentine, or Hammered finish. 14k gold riveting brushed wedding band. This incredible wedding band features an beautiful brushed center with a polished border either side. Simple yet timeless design. Wedding band measures 7mm wide and is an easy to wear comfort fit design. 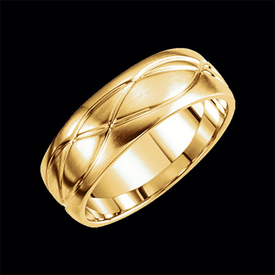 This band is available in your choice 14k White or Yellow gold, 18K gold, and Platinum. 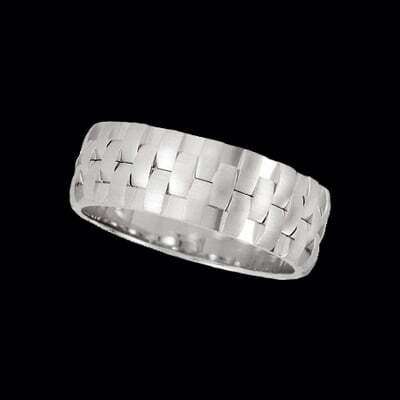 Great wedding band for a lady or gent. Custom made to order. Price shown is for the ladies size 5. Intriguing 14k White or yellow gold wedding band. Wedding band measures 8mm in width and is a good weight. Example, size 10 weighs 9.80grams. Mechanical design band is available in a large variety of sizes. Captivating 14k gold classy white gold wedding band. Wedding band measures 6.5mm in width and is a comfort fit band. 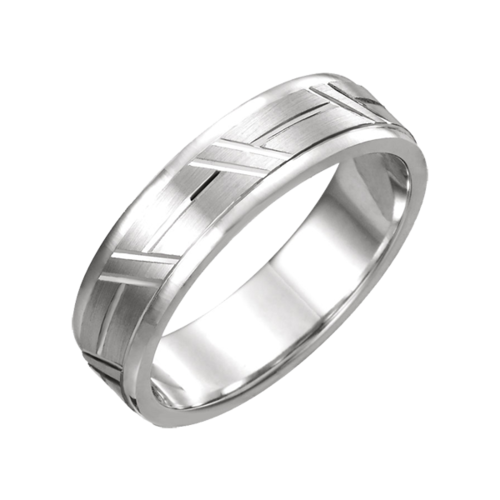 Ring is a lovely combination of satin finish in the center band with polished bands on either side. Also available in 14k yellow, 18k gold's, and Platinum. Our 14k gold white lightning wedding band measures 6mm in width and is an to wear comfort fit band. 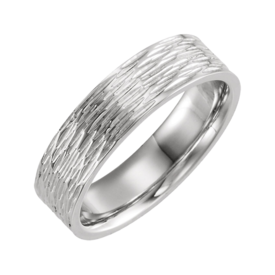 This band features a lightning bolt style center that is a brush finish, surround by luxurious high polish finish. Wedding band is available in 14k white (shown), 14k yellow, 14k rose gold's, 18k gold's, and Platinum. Nbsp; Additional widths also available. Nbsp; Email for additional pricing. 14k gold polish and textured wedding band. This exciting wedding band features polished ridges at it's center bordered either side with a textured finish. 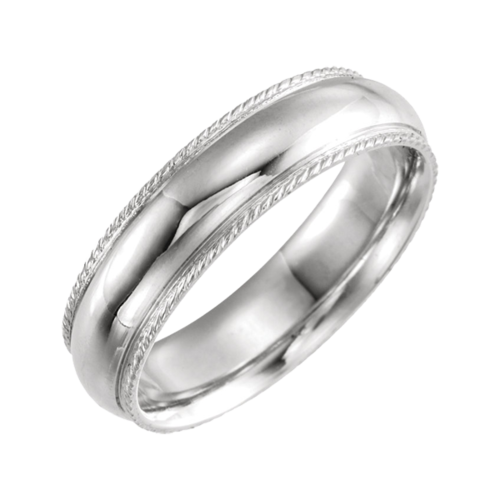 Wedding band measures 7mm wide and is an easy to wear comfort fit design. This band is available in your choice 14k White or Yellow gold, 18K gold, and Platinum. Great wedding band for a lady or gent. Custom made to order. Price shown is for the ladies size 5. 14k gold fancy wedding band. This captivating wedding band features a satin finish center design bordered either side with a milgrain sides then a polished border. You'll love this 7mm wedding band, it an easy to wear comfort fit design. A timeless design you'll still love on your 50 year anniversary. This band is available in your choice 14k White or Yellow gold, 18K gold, and Platinum. Great wedding band for a lady or gent. Custom made to order. Price shown is for the ladies size 5. 14k Gold off set breaks design wedding band. This handsome wedding band features a two raised lines with off set breaks in the design. Wedding band measures 7mm wide and is an easy to wear comfort fit design. This band is available in your choice 14k White or Yellow gold, 18K gold, and Platinum. Great wedding band for a lady or gent. Custom made to order. Price shown is for the ladies size 5.